Adchoices is annoying many computer users as well as mobile users. Many people thinks it as a malware or virus. But actually it is a legitimate advertising platform to show the personalized ads to the users. Users have been battling with overwhelming amounts of Ad Choices ads and have searched for ways to get rid of them. Below we are providing information about AdAchoices, issues related to it and its removal guide. AdChoices is a legitimate online advertising service which helps individuals and organizations to promote their products or services to internet users using targeted and personalized ads. Though It’s a very legitimate advertising method which doesn’t bother users. But sometimes they become a bother as a result of users accidentally installing a particular add-on or program containing adware. As Adchoices is a legitimate service, So it is not possible to scan and remove it with any tool. But you can remove the adware program which is responsible to show all those annoying ads. Normally Adchoices will only show the Ads in a web browser and only in limited numbers which does not annoy any user. But if you are seeing lots of ads and at unexpected places like ads in Pop ups, Ads in browsers. Or you are seeing a different home page or being redirect to a different ads page. Then surely you should have to follow the below steps to get rid of those annoying ads. Uninstall Suspected Unwanted Programs / Apps. Uninstall extensions and add-ons from the Browsers. Scan system with Antimalware and Adware removal tools. Once an adware installed into system it is very hard to remove that from the computer. But still our first step should be to check and uninstall the unknown programs / apps from the device which are the cause of showing unwanted ad & pop up. See the common steps how you can uninstall programs on different devices. To remove AdChoices ads from your computer, You have to remove adware and other suspicious programs manually. Do this from the Programs section and then scan with an anti-malware application. Go through the list of applications installed and remove suspicious application and obviously malicious applications like those you didn’t install. Eg. Babylon, Search Protect by Conduit, WebCake, etc. Select and click on Uninstall / remove to remove the application from the system. 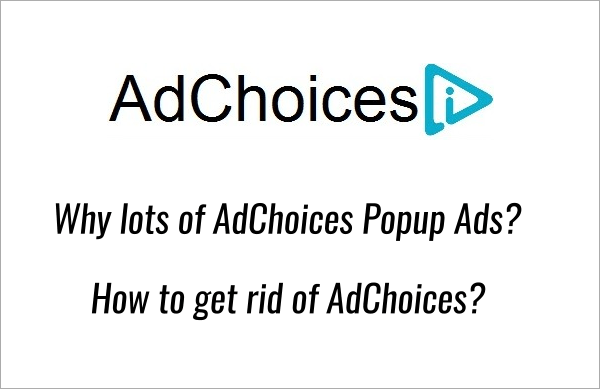 To remove ads by AdChoices on Mac first uninstall all suspicious application. And then scan with a good anti-malware application. It will make sure you’ve removed every suspicious components. Open Finder from the dock and select Applications from the sidebar. In the Applications folder, look for AdChoices or other suspicious programs like Babylon, Search Protect by Conduit, WebCake, etc. Right-click on each of such entries and select Move to Trash. After uninstalling the program now next step should be cleanup your internet browser for any unwanted toolbar, extension or add-on. See the below link to disable the pop up ads in Chrome / Firefox / Internet Explorer / Edge. There is an inbuilt option in every browser to do this. Go to How to disable pop up ads in browsers to see the instructions to remove popups. Even if you have uninstalled the unwanted program / extension, but still you should have to follow this step. As leftover files can make the adware come again after restarting the device. So before restarting you should scan your device with an Antimalware ( best Antimalware Software ) & with an adware removal tool (Adware Removals Tools). These tools are helpful in removing stubborn adware. Adware causing to show lots of popup ads are usually very tricky to uninstall. If you feel that still you are facing some issues even after scanning with adware removal tools & malware removal tools. And you believe that it is a browser based ads. Then you need to reset the browsers to completely eliminate adware from the browsers like Chrome, Internet Explorer, Firefox, Opera, Edge etc. Why I am seeing lots of Adchoices Pop up Ads? If you’ve been presented with ads by AdChoices on almost every website you visit on your browser, it should be from any of the recently installed applications on your computer. Other possibility is that some adware has entered into the system and unknowingly install adware in the form of browser add-on, browser preferences, extensions, plugins, toolbars, etc., in the device. Many applications bundled adware with them which made to display ads anywhere. They can be found on Mac, Windows and even smartphone operating systems. When installing applications, make sure you see the optional, custom or advanced components option of the application. Unchecked the marks that claim that you want to install components which don’t seem legitimate or seems third party application. If you have already installed some adware unknowingly then see the above guide that how you can disable or remove AdChoices from your device. Once you notice ads showing at odd places on your computer, webpage redirection or the web pages opening themselves and showing ads, Pop up ads, Then it means you are victim of some adware & its time to cleanup your system from junks. So you should always keep an eye on the excessive and unwanted ads. Is AdChoices a virus or malware? No Adchoices is not a virus itself, but sometimes lots of ads are the result of an adware. So lots of ad display can be a symptom of an adware infection. Adware can be result of or can lead to a malware. It also indicates that your system is vulnerable to internet threats. There are 2 AdChoices ads which annoy me because the timer in the top r/hand corner do not work & lock up my tablet as a consequence. Each time they appear in Word 2 I have to power off to get rid of it. The 2 with timers that don’t work are: henty field days/mlc & design2 (something) – a Vic govt ad. Please fix or delete. I don’t mind ads …. just those that don’t work. We recommend you to please reset your browser, it should fix this problem. If it doesn’t work then download and run the following tools, it will remove most of the adwares from your computer. Sorry to say but the above removal instruction is for Windows computer only. We recommend you to please try Zemana Removal App to remove it from phones.